Geared toward practitioners of amigurumi, the Japanese art of crocheting stuffed dolls, this is the only how-to book dedicated to dinosaur patterns. 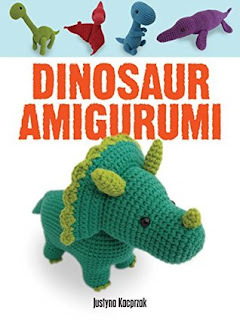 Learn how to crochet fourteen adorable prehistoric creatures to cuddle, from familiar species such as Tyrannosaurus rex, Triceratops, and Stegosaurus to Mosasaurus, Edmontosaurus, and other lesser-known but equally lovable varieties. Each project features complete, well-illustrated instructions, plus full-color photos of the finished model. The patterns are easy to follow and are suitable for crocheters at all skill levels, from novices to experienced hands. This book of crochet dinosaurs was too cute to pass up. I've crocheted little animals before with whatever leftovers I had at hand (mass produced until I had blisters for the tween to sell for entrepreneur project) and decided to do these right. Armed with the right sized hook from the store and the recommended yarn I ordered online, I got started. This is my Dimetrodon in progress. I found the pattern devilishly simple and ALL the stops and starts along the way were entirely my own doing. For me, the starting place for each round seemed to wander so I started using a stitch marker so my own semi-inconsistent crochet habits don't make my dinosaurs' heads all crooked. 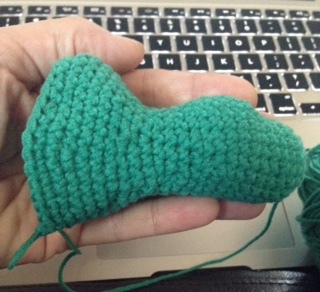 Otherwise, I just keep doing what the pattern says and it takes shape. The Cotton-ish yarn by Vickie Howell Bernat and hook size make a nice tight piece and I've had no issues with stuffing popping out between the stitches. The recommended yarn is very smooth, however, and combined with the slick metal hook taking my time has paid off. I definitely recommend this book of patterns. These little guys will make terrific stocking stuffers for kids (and adults). If you're looking for something a little different to get into (or a project you can tuck in your purse or tote to work on whenever) this will definitely keep your hands busy. Oh, and they are completely addictive. Does this book motivate me to strike out on my own, experiment and see what sort of shapes I can create? Yes. For that reason alone I give it full marks.